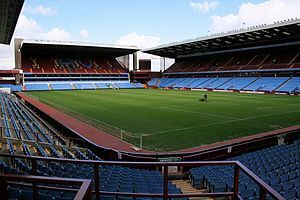 Villa Park, ii England kay Birmingham shehr, mae sthit ek football stadium hae. Ii Aston Villa ka home ground hae, ii ma 42,682 logo ke baithe ke jagah hae. ↑ 1.0 1.1 1.2 1.3 1.4 "Villa's plan to rebuild North Stand", 14 May 2010. Retrieved on 11 November 2010. ↑ "Community Shield switched to Villa Park as Wembley hosts Olympics", 18 May 2012. Retrieved on 1 June 2012. Wikimedia Commons mae Villa Park ke baare mae media chhapa hae.